If your weatherman hasn't yet warned you, just step outside and take in the sudden warmth and wild wind- both harbingers of big storms ahead. Rain, so much rain. Perhaps even while you read this it will be raining. It will fall fat and heavy and sometimes sideways. It will splash little droplets of dirt up the sides of everything. It will settle on the hairs of the animals and run down between, making those animals shudder sometimes. It will inspire grass to grow and create mud. So much mud, but then so much grass. These are the ever-present discomforts and balancing rewards your farmers live by. Our boots will triple in weight by the orange-clay mud riding our feet around, all of our hats and hooded garments will be wet, but the green will soon burst forth wildly from the gold and brown winter dirt and out of the many bare twigs we call a forest. The cattle will kick their heals in frolic, especially the youngest, and they will all grow slick and fat. The pigs will back off their grain habit in favor of sprouting acorns, sap-heavy roots, crunchy-sweet blackberry crowns, and greenbrier leaflets. The chickens, who are seeing green for the first time in their short lives will lay yellow fat along the edges of their strong, bug chasing legs as they pick every blade out of each days' fresh pasture. We may grumble about the mud and our water-pickled hands, but we will do it with a little smile in our eyes or a shrug of our shoulders because we know the green is coming. Of course, the animals are not concerned with fitting in all the tractor work ahead of the mud. For their part, they are doing their everyday animal things. Hungry for fresh grass, the cattle are nibbling every little bit they find in their pasture rotations and coming eagerly when a new paddock is opened. The spring hogs are getting fat and close to butcher size while our pregnant sow Brenda is so very close to bursting with bacon bits. Finally, the first batch of chickens have enough little feathers, and the weather has been gentle enough that the heat is now off in the field brooder and they are beginning their lives as ranging free birds. 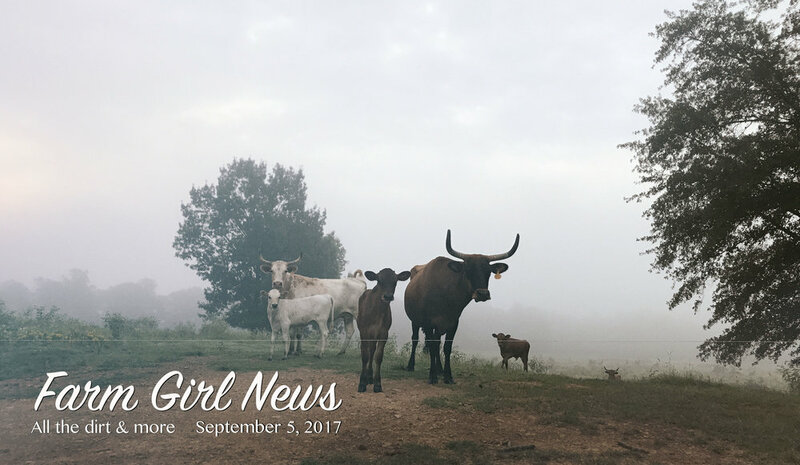 If you've been following along for a while, you know the Farm Girl team is nothing if not ambitious and hard working. And we've saddled up for another round of challenge and change: I'm headed back to college to finally finish up my bachelor's degree. I have just one (heavy) semester to tackle, but it will pull me away from the farm more than I care to admit. Always intrepid, Mr Farm Girl, aka Tremendous Travis is taking on management of production and some of the marketing duties while my focus is divided. With the reins in his own hands he has big, beautiful ideas about expanding production and deepening our sustainability that I look forward to elaborating over the season, but in the meantime look for him at market and share pickups and forgive us the turkey-jerkiness that is bond to accompany this perio. The critters have had a pretty easy go of winter so far. It's only been very very cold for a short time and some greenery is already beginning to peak out and getting us all excited for the spring that is still far off. The cow herd welcomed two calves from a pair of our best cows, including the ever-saucy Elvira, and both are either nursing or fluffed up sleeping in the sun all the time. Our biggest batch of chickens ever has just joined the new field brooder and with support from the propane hover heater, they have been cozy and comfortable all the way through their first week. And aside from one heavily pregnant sow pacing and rooting to keep busy in her discomfort, all the other pigs pass the days napping in their hay bedding or in the sun. Farm Share Enrollment is OPEN! Oh Farm Share, how we do love you. As farmers we get to really know our share families. We watch their kiddies grow, we bond over new braising techniques and picky eaters of all sizes, we craft our product lineup around real people and their weekly needs, and we fling our farm open wide for all to share. And most of all we delight in knowing just which lovely people the burgers and roasts and sausages will nourish day in and day out. As shareholders, you get to know your food, really know it. Come see it on the hoof and in the field, hear the stories of the animal shenanigans and weather woes, witness the frown lines on the earnest folk who work all hours to raise it, and then taste the difference the love and open space makes on your plate. Many people signup for the farm share their first time for the fantastic price break and the best of our production, but they stay for the relationship and the fine dining. Whether you have been a longtime shareholder or this will be your first go 'round, we expect it to be the best yet. All the pork? Check. Big time free-range chicken? Check. More beef variety than ever before? Check. NEW allergy-sensitive yet highly addictive sausages? Check. The sharp sunlight is both blinding and unwarm in the woods, casting long shadows from the barren saplings all around. It is not quiet. Breaths of nipping wind knock empty limbs together overhead in a strange wood chime of snaps and cracks. Small animals unseen rustle through the thick blanket of crisp, fallen leaves. Crows ridicule each other and tell crass jokes all around. It is winter. These same woods, so simple and tight with cold today, vibrate with green at other times of year. The explosive growth, saturated colors, and boisterous symphony of innumerable living things are at times thicker than the humidity. But not now. This is the season that lets us forget all the biting things, the grabby thorny vines, the violent storms, the heavy blanket of heat, and all the itching. We hustle in our chill through the short days and begin to pine for the luxury of less clothing, richer sunlight, and galvanized days that seem to stretch impossibly long. Without this time, the other would be too oppressive. At least this is what I tell myself as I drain yet another hose, feed yet another hay bale, wrestle with many binding layers of clothing, and long for these short days to pass quickly. The animals do not seem to pine for anything other than food these days. Staying warm takes calories and we oblige. Since the recent drought has let us burn right through any forage stockpile, we are settled in to feeding the cattle quite a bit of hay daily. The pigs for their part are also getting extra rations along with the last of the pumpkins and some hay. And the last batch of chickens for the year do little but eat and sit in the sun cooing to each other. They do not fuss about the frost or furrow their brows at the forecast, like their farmers do. They just frolic when the sun warms them, eat much, and cuddle closer to their brethren through the night. Lets all do the same, shall we? Many small things have gone wrong the last few weeks- from widely wandering pigs, to broken truck windows and mechanical failures, schedule hiccups, and generally crispy growing conditions but none of that matters when its pumpkin season! The farm girls and I agree, the best job of the whole year is collecting the retired fall decor from the festive folk in Little Rock after Thanksgiving and then chucking all those gourds out of a moving truck to the grateful critters of the farm. The volume and variety of beautiful pumpkins is always stunning and we remark on nearly every single one, then pick a spot in the field and try to smash it into a million delectable pieces. The pigs chase the truck and jocky each other for first dibs on the next fruit to hit the ground. They crunch and slurp the seeds and pumpkin meat, and play with those that don't smash. Next summer this field will be chock full of feral pumpkin and squash plants bursting from the hog-fertilized earth growing a whole new crop to be enjoyed again next summer. After the fun of chuckin' punkins, the satisfaction of channeling those used resources from our city friends into the full seasonal cycle of the farm is the real pleasure. Every person who adds their pumpkins to the pile at collection is happy to know they are going to a purposeful next life, we farmers find joy in sharing the bounty with the animals, the animals certainly enjoy them, and as the sprouting vines grow and reproduce over the coming year(s) we are daily reminded of the community we nourish and grateful for the ways they are nourishing us. A long time ago, when I was an earnest but idealistic greenhorn, the flock of sheep I was learning to manage had busted out of their paddock and were grazing the pasture I was saving for lambing season. Having been planted with special grasses, allowed to mature perfectly for months, and with hungry new moms just days away; that pasture was precious. This was the best forage on the farm and there would not be enough time for it to regrow if I allowed the flock to stay where they were now so happy to be. Despite my panic, I attempted to herd the hungry horde back towards the pasture I preferred for them. I tried and tried and tried. Then I cried out of frustration, questioned everything I had ever done that lead to this moment, and with resignation, set to trying yet again. After nearly two long Sunday-morning hours and all the methods I could think of, I was at a loss. Then, another employee of the farm happened to be out for a stroll on her day off. She offered to help, and with no special skill or experience, her mere presence made the job of herding the sheep suddenly effective, and lifted my mood as well. The lonely impossible became manageable teamwork. I've had the opportunity to learn this lesson again and again over the years, each time discovering that the world is full of good and helpful people and our community is deep and resourceful. The last week was another refresher. For several weeks now we have had a critical lack of running farm vehicles that have left us borrowing a truck for marketing and unable to do our own hauling. But along for a stroll came the Carson family, offering assistance by making an essential trip to the butcher and by bestowing their well-loved and unneeded truck on some unbelievable grateful farmers. They recognized our need and were there at exactly the right moment. I can't thank them enough not just for their years of support as customers but also for their assistance this week in turning a very dispiriting moment in the life of our operation into an uplifting reminder of the community we are so proud to serve. Thank you Carsons and all of the others of you out there, and there are so many, for supporting us as we bumble and learn and try to feed you. Gourd, pumpkins, and squashes of all kinds are welcome as long as they are intact. A little paint or soft spots are okay. A good rule of thumb is if you don't want to handle it, the pigs don't want to eat it. Holiday gifts. This year we have Gift Certificates, Tshirts, bandanas, and hand carved kitchen spoons available for preorder and delivery by black Friday. Keep an eye on the webshop or email Katie for more details. Farm Day is cancelled for this year. We hope to reschedule during a lovely, quiet time in Spring. If you would like to schedule a private tour of the farm for your people, drop us a line, we're happy to show you around! Not-Meat available for Holiday gifts. This year we have Gift Certificates, Tshirts, bandanas, hand carved kitchen spoons all available for preorder and delivery by black Friday. Keep an eye on the webshop or email Katie for more details. My newsfeed today, as every day anymore, is full of flames both literal and figurative. My native California is burning down, women I admire and many I hold close are adding their voices to a chorus of injustices, our political leaders cannot seem to work for their people, and yet there are still so many hungry, wounded, and scared in the greater world. As any millennial, first generation farmer, I have certainly read my share of Wendell Berry. Many times before I have turned off the radio or pushed away from the computer, reframed myself with his poem "The Peace of Wild Things", and found solace in the pastures and woodlands of the farm. We try to let our critters live as much like wild things as possible, and so there is often peace found in working and resting with our farm. But these last few weeks have offered a disheartening entropy in lieu of the nourishing grace of Berry's poem. With inadequate and drought-weakened fencing, our wild things have been running rough shod over us. Our many jaunty vehicles have all taken sick leave at once. The persistent dry spell has piled onto an otherwise strange year of weather to leave us with very little vegetative regrowth and little to no acorn drop for our foraging critters. And with ongoing and still unsolved fertility challenges in the pig herd, we are staring down another year of short pork production. If fire is a process that releases energy and products then wildness is definitely some kind of fire. In times of harmony, our wild things and piece of wilderness give us their energy and help us produce so much satisfaction for ourselves and our community. In discord, like now, our wild things are an overwhelming jumble of pieces that consume us and seem to produce only more frustration. I wrote much of this sob-song after the worst farmer's market of the year, but in the 24 hours since, it has rained. Already some of the grasses are perking up and the electric fences are a little punchier with moisten earth to ground them. Soon the pigs and cattle will remember not to cross them. Soon the vehicles will be reshuffled and some replaced. Soon the pigs will be sorted, tested, and culled. So these wild pieces move in small measure towards a less inflamed time. This is how we do it: patience, persistence, peace. Early the other morning, I was looking at Instagram, as we all do (right?! ), and one of the farms I follow broke the romantic seal of Instagram with a "truth" post. These are the kind where we farmers talk about how hard it is to make ends meet despite long hours and abundant heart, or when all the machinery breaks on the same day, or the big flood/fire/storm that throws all the pieces in the air. Amy Shliffe of Blue Whistler Farm in Durham, NC found herself picking out animal pictures to post while she pumped gas and realized she should share the reality of how she spends her time "farming"- driving. The life of the animals is, in reality, about as romantic as the Instagram posts. They really do enjoy the sunsets, the camaraderie, and the lush pastures pretty much all the time. But your farmers do a lot that is decidedly less photo-worthy to make that life of leisure into a livelihood. I was inspired by Amy's post, mostly because there was no disaster to report, it wasn't a particularly exciting break from the lovely critter life, just the normal, mundane thing she does that makes the rest possible. In that vein, here are some of the mundane things I have been doing the last week that keep the wind in the sails of our jaunty little ship. Like Amy, this mostly means driving. It takes five hours to haul four legged animals to the butcher (roundtrip) and a tank of fuel. So here I am at 4 am fueling up, with a trailer of hogs eventually destined for the Arkansas Times Heritage Hog Roast, butcher bound. Repairing fences is an ongoing maintenance job, and this week I spent many many slow, tedious hours patching the little disconnects in electric poultry netting. Thank goodness for podcasts! Waiting for the truck to bring new turkey crates. That's Sneak the Great Pyrenees, and thats the highway by our little road. Most of the actual farming is done by walking. All seasons, all weather conditions. Often I log 4-5 miles a day just doing regular work. Those hogs! A few of the 12 roasters finally on the palate and ready for the bbq competition. emails, blog posts, promotional blurbs, website maintenance, bookkeeping, researching various animal issues, keeping track of shares/inventory/delivery dockets- theres a lot of administration that happens before and after all the other work. The days are noticeably shorter now, and summer is making it's typical last stand. But without the humidity to support it and the dropping angle of the sun, it's hard to get too brutally hot. Instead, we start to furrow our brows about the dryness. The sporadic or non-existent rain is totally normal for this time of year but feels rude after the generous, well-timed showers through the summer months. Now the grasses are shriveled, the critters panting, the fire ants resurgent. But the return of the crow racket, near constant cool breeze, and yellow tinge to the woodlands remind us that this discomfort is short-lived and the pleasantries (and precipitation) of fall are right around the corner. The cows were nonplussed to welcome Bully McBullface, our new sire, to the herd this week. He's a young fellow and still spends much of his time wrestling and running with the other teenagers in the herd, but very soon his unique Wagyu lineage will influence every bit of beef we sell. Sometimes called Kobe, Wagyu cattle are essentially Japanese beef cattle and are long famed for their incredible marbling and mild nature. Our guy is a cross between the two most prized lines of Wagyu and descends directly from the original stock imported from Japan. His coloration is unusual for Wagyu and meant he couldn't be registered, despite his stellar breeding. But since our only interest is the quality and flavor he imparts on his progeny, silver-gray is good enough to stay. It will be several more years before his impact will be visible on your dinner plates, but the jump in quality will be well worth the wait. The fencing challenges of the last few weeks are starting to sort out thanks to the persistent attention of Travis, fencer extraordinaire. The wide-ranging, freewheeling pigs are now mostly contained (with some sorting left to do) and the cattle once again moving as one herd. We have had a short drought in chicken, but since the fall flock heads to the butcher tonight, we will all be enjoying those beloved thighs again in no time. Many of the larger animals do not respect the electric fences. This is a painfully embarrassing admission for a rotational grazing and electric fencing professional. While our limited attention has been focused on the fires in front of us, little shorts have accumulated and undermined the fence system, which the critters inevitably noticed. And shameful as it is, the cattle and pigs are about as disorganized today as ever. (A full account of their shenanigans will find its way on the blog in the coming days.) But we wouldn’t be longtime practitioners of farming at all if we couldn’t find the bright side and the forward footing! Instead of frustration, arguably a more productive feeling, instead I marvel at the millions of little things to learn about how these critters behave when they make their own decisions. I can (and have) waxed poetic about the fine line between our needs as lords of this little world and the myriad living things in our charge. The animals already have the tools they need to live a comfortable contented life without us but I want the experience of cohabitation with and ultimately eating them to be as pleasurable as possible. With patience, we find these goals are complementary and brimming with great potential for collaboration between the farmer and the farmed. But enough poetry! There are cattle in the yard, pigs in the pond, and fences to fix. So many fences. This dog. This dog. I have loved others- the fenced and groomed ball chasers of my childhood, the poorly considered and badly behaved pound pup of my early twenties that destroyed my first apartment, the battered old beast that only reluctantly accepted me as the new best friend of his person. But this dog. Rufus saw me into adulthood, both of us tripping over our newly adult legs together. Then I had babies and he laid at my feet through both rounds of postpartum depression. He watched over my crawling, then toddling, then ear pulling, then running and reading babes as if they were his own, not once even smelling the food in their grubby hands. He never made the same mistake twice. He was so careful not to offend that he wouldn't even eat in front of people, going hungry in company just in case they'd rather have his full dish. Even on the morning of his last grey-haired, arthritic day he kept his guard post in front of the house, doing his best to stay between his beloved people and any other living thing. There were other times I prepared to say goodbye. When he was a huge, gangly six month old, a passing truck tolled him up, shattering his pelvis. He lay for three days in our living room, breathing shallow ragged breaths, barely lifting his head as we came and went. Finally on the fourth day as we steeled ourselves for the hardest decision, he tried to stand and whined as if for help. We carried him outside, where he relieved himself, careful even in his pain to follow the rules. His injuries grew into nothing more than a slight listing favor for the bad leg. Another time he challenged a passing ambulance and came up to the house on three legs, the fourth dangling in the most cruel, stomach-churning way. Again he lay in our living room, now four faces creased with concern and wet with tears considering his condition. We pretended we could afford the vet bill and went ahead with the X-rays and surgeries and weeks of tending and nursing. Like before he went on, now with another leg to favor, as intent on tending his people as ever. Finally, countless injuries conspiring with spiraling heart worms, hearing and even voice failing, our boy had one last accident. This time there was no debate, no days of watching and waiting. We knew. And with care and intention, we finally let him loose. Days have passed since, but I can still hear his bark booming in the night and feel his calm vigilance in the air. I am so grateful to have had his friendship and support all these years, and so relieved that he is no longer confined to a body riddled with the compounded pains of a life spent guarding his flock. You are so beloved and sorely missed. Goodbye Rufus. Working outside, especially in a field where so much depends on the living thing around us, the weather is everything. We have been grateful to enjoy a milder than usual summer with plenty of regular rain. As the heat has begun to reach triple digits these last few weeks, there has been a merciful parade of afternoon showers to help the critters, the forages, and the farmers refresh. Friday's storm spent a lot of time warning of its approach with booming, rolling thunder and blustery, cool wind, giving me a chance to finally catch a time-lapse of these lovely and dramatic summer showers. Enjoy! The hot air was so full of water, so fat with the blanket of summer, that it could take no more and the sky itself began to sweat. The next day, the same, and on for two weeks of afternoons. Sometimes the clouds piled on top of each other in pillowy concoctions and dropped lightning, sometimes the rain fell from blisteringly clear, baby blue skies, always the humidity hung impossibly thick in the air until breaking into warm fat drops. Between these afternoon showers, the pooling dew and dense fog of the early morning, or the dripping sweat of every moment in between, we are all resigned to being some kind of wet at all times these days. Otherwise there is something luxurious about the version of summer we've enjoyed this year. The many hours for work and revelry have come with milder temperatures and regular rains so the work is pleasant to do and there is oh so much grass. The next few weeks look to be a pinch less humid with very little chance of rain, but quite a bit hotter so we are bracing ourselves for the beginning of a more typical July/August transition. Piglets! A pair of sows that had farrowed just in late April are back at it with fresh litters this week. Both ladies lost some of their spring babies to vultures and let their remaining brood move on to another lactating sow. With no work load, the mamas came back into season quickly and now Brenda Lee has produced 9 healthy wigglers while Becky Lynn is waiting for the perfect moment to drop hers. The turkeys are growing very fast and are extremely active- catching flies out of the air and curiously approaching everything new. We expect to harvest (and freeze) the turkeys when they reach ideal table weight in mid September. The hardest feat of turkey raising is hitting the ideal weight range (12-18 lbs) in the very narrow window of days prior to Thanksgiving. By planning to harvest in early fall and store the birds, we will gain some flexibility in hitting the right size and avoid the mad rush to process during an otherwise busy time of year. The cattle are doing well, though we are still carrying more animals than we'd prefer. A few more underperforming cows will head to the processor in the coming weeks and the fat steers that yield the very best cuts will come off in late August. With several daughters soon to join the breeding herd, our current bull has reached the end of his tenure and we have begun shopping for a Wagyu fellow to replace him. I hope to update you on this project very soon.